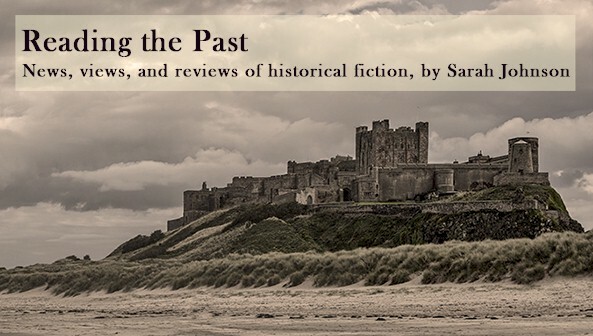 I'm pleased to present the following essay by historian and novelist Bill Rapp about the rewards and challenges offered by historical fiction. His new novel The Hapsburg Variation, second in his series of Cold War thrillers, was published in December by Coffeetown Press. This may be stating the obvious, but the challenge for anyone writing historical fiction is to create a world he or she has never lived in or experienced because it is, quite simply, a period in time set too far in the past. It is clearly a very difficult task for a writer--or anyone, for that matter--to try to recapture the outlooks, beliefs, attitudes and desires, not to mention physical challenges of simply surviving, in a world so different from one's own. Of course, that has not stopped a host of writers, many of whom have given us some excellent mysteries or fictional works set anywhere from ancient Egypt and the classical world of Greece and Rome, through the Middle Ages, and right on up to the Second World War and the decades that followed. The reward for us as readers has been the pleasurable reading we've received, for example, in the novels of Margaret Doody, Steven Saylor, David Wishart, and Lindsey Davis set in classical times, or the medieval mysteries of Ellis Peters, P. C. Doherty, Michael Jecks,and Candace Robb, and the more modern pieces from Harold Adams, J Robert Janes, or David Downing and Philip Kerr. What these writers succeed in doing, in my mind, is to create an atmosphere that corresponds to one in which they've set their stories, but which also speaks to the modern reader by weaving in more contemporary attitudes and perspectives. Achieving that balance is not an easy task. For me, the challenge in writing a spy series set during the Cold War is made a bit lighter by two things. First, as a historian, I love reading about and researching the past. It's something I learned to do as a child devouring history books like the American Heritage series, and then honed as a professional skill during those years in graduate school working on my Ph.D. You might even call it that proverbial labor of love. Second, the Cold War is not nearly as far away as ancient Rome, or even Depression-era South Dakota. In fact, I experienced the period as a child and young adult. Moreover, the world of conflict and competition, with many of the same adversaries, resembles that of the Cold War (and this after we naively assumed the formal end of the Cold War would usher in a Great Peace Dividend and the End of History). It almost seems as though we've gone full circle, with the daily news filled with stories of Russian meddling and possible collusion in Washington, competition in Latin America and the Middle East, and the worrisome rise of a new global power in the Far East. It is not hard to imagine Karl Baier coming out of retirement today to resume his career at the Central Intelligence Agency, sharing his experience and lessons learned with a new cohort of eager young intelligence officers. Ultimately, though, it comes down to the characters the writer creates and their ability to move the story in plausible and interesting directions. Those people must fit comfortably into the period the author has selected to place his or her story. They must also speak to the modern reader as credible and engaging characters the reader would like to meet or confront in any time. To paraphrase the great Raymond Chandler, the hero--and the antagonists--must be good enough for any time they inhabit, but the best ones for the period in which they live. Bill Rapp recently retired from the Central Intelligence Agency after thirty-five years as an analyst, diplomat, and senior manager. 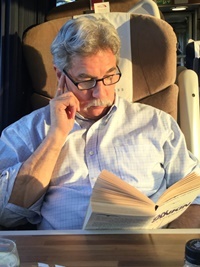 After receiving his BA from the University of Notre Dame, an MA from the University of Toronto, and a PhD from Vanderbilt University, Bill taught European History at Iowa State University for a year before heading off to Washington, D.C. 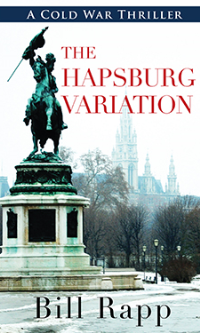 The Hapsburg Variation is the second book in the Cold War Spy series featuring Karl Baier. Bill also has a three-book series of detective fiction set outside Chicago with P.I. Bill Habermann, and a thriller set during the fall of the Berlin Wall. He lives in northern Virginia with his wife, two daughters, two miniature schnauzers, and a cat. For more information, go to BillRappsBooks.com. Just discovered Doody. And now you. My TBR stack makes me look like a hoarder but it is worth it. Welcome to the over-stacked TBR club! Doody is a novelist I've been meaning to read for some time.